Nepal cricket team is all set to play their first warm of match of UK tour against Hampshire Hogs Cricket Club. 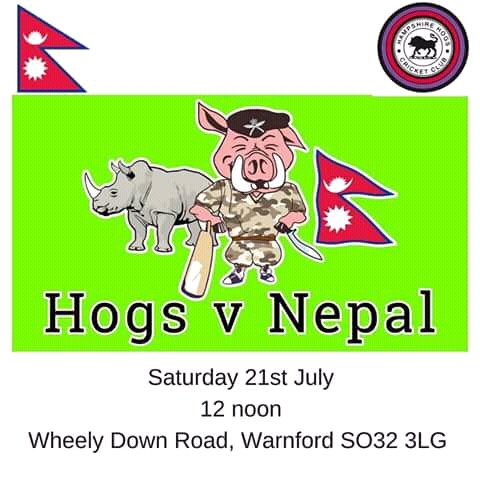 As per the news on Hampshire Hogs Cricket Club’s official website, it is said that Nepal will face Hampshire Cricket Club on 21st July, Saturday. Match will take place in Wheely Down Road, Warnford. It will be 50 overs per side match. It will give Nepal much needed exposure and clue about the condition before the T20 Triangular Series and Bilateral ODI series against Netherlands. CricketConcern understands that Nepal will travel to UK on 19th July. Nepal cricket team is currently having closed camp in TU cricket ground with primary 20-men squad. Nepal will face MCC and Netherlands as a part of T20 Triangular series on 29th July followed by two ODIs on August 1&3. Nepal was also supposed to face Scotland in European tour, but as per Espncricinfo, Scotland cricket board has already finished up their budget for 2018. Nepal’s ODI match against Netherlands will be their first ever ODI match in the history. Similarly, Nepal is going to play T20 match with full T20I status after a long gap of 3 years. Nepal will get fortune to play in Lord, popularly known as home of cricket, for the second time. They played there for the first time in 2016 against MCC.